Enduring Management Wisdom for Today's Leaders From Peter F. Drucker. Peter Drucker's Five Most Important Questions provides insightful guidance and stirring inspiration for today's leaders and entrepreneurs. By applying Drucker's leadership framework in the present context of today's leaders and those who lead with them, this book is an essential resource for people leading, managing and working in all three sectors—public, private and social. Readers will gain new perspectives and develop a solid foundation upon which to build a successful and bright future. They will learn how to focus on why they are doing what they're doing, how to do it better, and how to develop a realistic, motivational plan for achieving their goals. This brief, clear, and accessible guide — peppered with commentary from distinguished management gurus, contemporary entrepreneurs and dynamic millennial leaders —will challenge readers and stimulate spirited discussion and action within any organization, inspiring positive change and new levels of excellence. In addition to contributions from Jim Collins, Marshall Goldsmith, and Judith Rodin, the book features new insights from some of today's most influential leaders in business (GE and Salesforce.com), academia (Harvard Business School and Northwestern University), social enterprise (Levo League, Pencils of Promise and Why Millennials Matter) and the military (United States Military Academy), who have been directly influenced by Drucker's theory of management. The late PETER F. DRUCKER (1909-2005), known worldwide as the "Father of Modern Management," was a professor, management consultant, and writer. 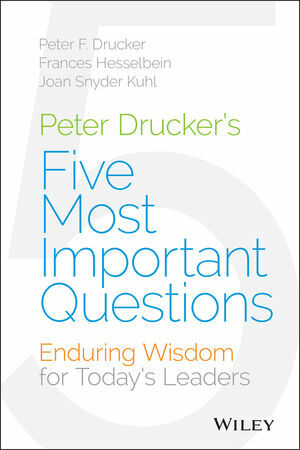 Drucker directly influenced a huge number of leaders from a wide range of organizations across all sectors of society. Among them: General Electric, IBM, Intel, Procter & Gamble, Girl Scouts of the USA, The Salvation Army, Red Cross, United Farm Workers, and several presidential administrations. FRANCES HESSELBEIN, a Presidential Medal of Freedom recipient, is the president and CEO of the Frances Hesselbein Leadership Institute (formerly the Leader to Leader Institute) and editor-in-chief of the award-winning quarterly journal, Leader to Leader, as well as co-editor of 27 books translated into 29 languages. JOAN SNYDER KUHL, founder of Why Millennials Matter, is an international speaker, leadership trainer, and consultant specializing in global talent development and generational engagement strategies.